Researchers at The University of Western Ontario have discovered a strategy for stimulating the formation of highly functional new blood vessels in tissues that are starved of oxygen. 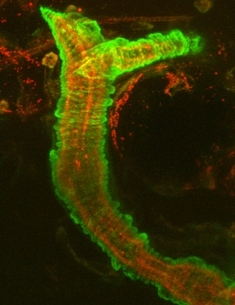 Dr. Geoffrey Pickering and Matthew Frontini at the Schulich School of Medicine & Dentistry developed a strategy in which a biological factor, called fibroblast growth factor 9 (FGF9), is delivered at the same time that the body is making its own effort at forming new blood vessels in vulnerable or damaged tissue. The result is that an otherwise unsuccessful attempt at regenerating a blood supply becomes a successful one. Their findings are published online in Nature Biotechnology. "Heart attacks and strokes are leading causes of death and disability among Canadians. Coronary bypass surgery and stenting are important treatments but are not suitable for many individuals," explains Dr. Pickering, a professor of Medicine (Cardiology), Biochemistry, and Medical Biophysics, and a scientist at the Robarts Research Institute. "Because of this, there has been considerable interest in recent years in developing biological strategies that promote the regeneration of a patient's own blood vessels." This potential treatment has been termed 'therapeutic angiogenesis'. "Unfortunately and despite considerable investigation, therapeutic angiogenesis has not as yet been found to be beneficial to patients with coronary artery disease. It appears that new blood vessels that form using approaches to date do not last long, and may not have the ability to control the flow of blood into the areas starved of oxygen." The work of Dr. Pickering and collaborators provides a method to overcome these limitations. This strategy is based on paying more attention to the "supporting" cells of the vessel wall, rather than the endothelial or lining cells of the artery wall. The research team found that by activating the supporting cells, new blood vessel sprouts in adult mice did not shrivel up and disappear but instead lasted for over a year. Furthermore, these regenerating blood vessels were now enveloped by smooth muscle cells that gave them the ability to constrict and relax, a critical process that ensures the right amount of blood and oxygen gets to the tissues. "FGF9 seemed to 'awaken' the supporting cells and stimulated their wrapping around the otherwise fragile blood vessel wall" said Frontini, the first author of the manuscript. "The idea of promoting the supporting cellular actors rather than the leading actors opens new ways of thinking about vascular regeneration and new possibilities for treating patients with vascular disease." Funding for the research was provided by the Canadian Institutes of Health Research, Heart and Stroke Foundation of Ontario, and Lawson Health Research Institute. Dr. Pickering holds the Heart and Stroke Foundation of Ontario / Barnett-Ivey Chair at the Robarts Research Institute. He is also a scientist with the Lawson Health Research Institute, and a cardiologist at London Health Sciences Centre.